St. Francis of Assisi Roman Catholic church parish covers an area of approximately 200 square miles. Overall we have around 150 parishioners. There has been a parish church supporting the community since 1855, based at St. Joseph’s Catholic church in Avon Dassett. In 1971 it was decided that Kineton was a better centre of the parish, and a house in Market Street was purchased as a presbytery and the parish priest came to live in Kineton. Catholic residents of Kineton at that time worshipped at St. Francis chapel in Bridge Street, which had been converted from a barn in 1927. 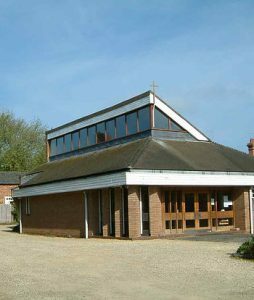 This church became too small for the growing congregation, and in 1975 a new and more convenient church was planned and built on land behind the presbytery. This is the current church of St. Francis. Some furnishings were transferred from the chapel in Bridge Street, the benches were obtained from Warwick Hospital Authority, the Stations of the Cross were donated by parishioners, as were the baptismal font, organ, books, and other items. The parishioners also took an active part in the planning and execution of the whole project. Over time, some of the furnishings from the chapel in Bridge Street were replaced, including a new stone altar, lectern, and credence table. During the past 25 years the parish has seen further changes. Another 2 buildings were bought in Southam Street. Anvil House became the home of the parish priest, and the cottage (next door and in front of the church) is used for Sunday school for the children as well as coffee gathering (after mass 1st and 3rd Sunday in the month) and a meeting place for various prayer groups in the parish.